Bruder supplements its highly successful range of vehicles with the Ausa Minidumper. Mini Dumpers are usually compact machines with articulated joint steering which are capable of transporting loads of up to 4 tons across uneven and hard-to-access terrain. Thanks to their four wheel drive and articulated joint steering they are highly maneuverable and capable of keeping all of their 4 wheels on the ground at all times. 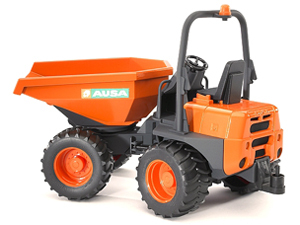 This new Bruder model is just like the Dumper D 350 AHG made by the Spanish firm AUSA. Just at its real life brother, the Bruder Dumper is equipped with articulated joint steering and a tipping trough that can be rotated and has great off-road capabilities like the original. The vehicle comes with a rear coupling which allows it to be combined with numerous towed vehicles out of the Bruder product line.